Complete high-performance exhaust & intake solution for the 993 Carrera; includes Maxflo Performance Exhaust System with Deluxe Oval Tips, Sport Cat X-Pipe, CUP High Performance Airbox Cover, BMC F1 air filter, and a DME/ECU Software Upgrade. DME/ECU upgrades are available for all 993 Carrera models, but you must specify which style of DME/ECU your vehicle requires. Early model 993's (1994-1995) typically use a DME software chip, while the later cars (1996-1998) use an ECU software tune. Cars equipped with the "drive-block" feature (any model years) use an OTP-style ECU. You can verify that your car requires an OTP by inspecting the stickers on your factory ECU. If the number on the Porsche sticker is 99361866600, 99361866601, 99361866602, or 99361866603, then you will need to select the OTP ECU tuning option. DISCLAIMER: The original factory ball-joint clamps must be re-used when installing these exhaust products on all 993 Carrera vehicles. 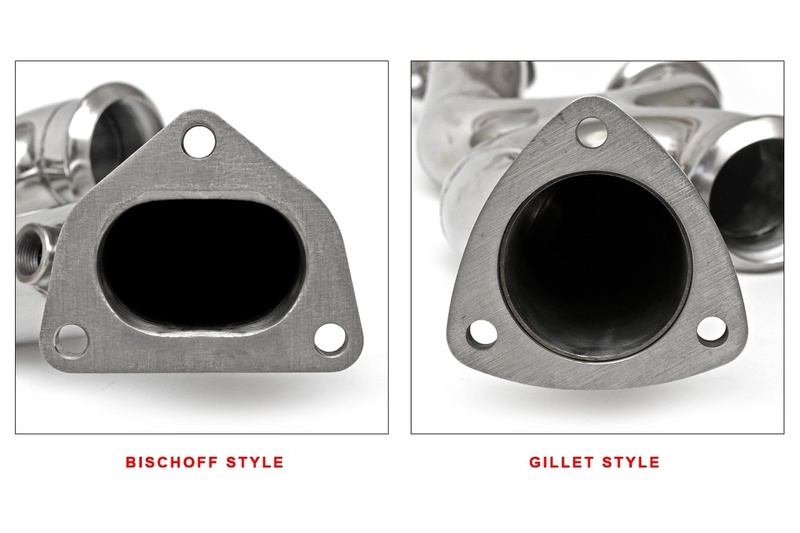 You must specify what style of header flange your vehicle uses: either Gillet (1996-1998) or Bischoff (1994-1996.5). Please refer to the photo below if you are unsure!